Rome is riddled with historical monuments. I commented in the first post that you can turn a corner and find a fresco or a sculpture on the next, but it’s almost that way with monuments as well. You can turn a corner and find columns sandwiched between two buildings, or just a wall of columns that once belonged to a great building. It’s one of the most fascinating things about Rome. The flat where we stayed had tourist maps of Rome, and I carried one around everywhere, taking us so our route crossed as many historical bits as we could. Some of these brilliant bits are on the map, but some aren’t. For example, below are two pictures. The first we crossed somewhere down by Trajan’s Forum. Nothing is on the tourist map and there are no signs to indicate what this once was, but two columns stood between old, yet newer buildings with pieces of others below. They are fenced off so no one can tamper with them. The second photo, the Temple of Hadrian, is marked on the map and is nestled in a small courtyard when you walk between the Pantheon and Trevi Fountain. The original structure was built by Antoninus Pius in 145 AD. The only bit left, this row of Corinthian columns, was added by Carlo Fontana to the plans for a 17th century papal palace. The building today, however, is not quite so lofty as it houses a bank. Trajan’s forum was at the end of a long day, but it made it no less interesting. 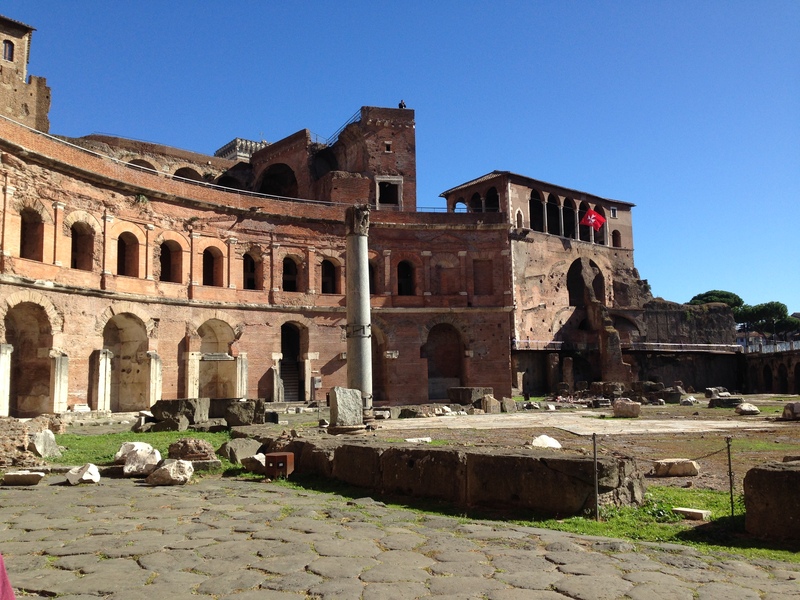 Designed by the architect Apollodorus, Trajan’s Forum was built in the second century and consisted of a series of markets, a temple, a basilica, and three monuments to honour Trajan. This side that is curved in a hemisphere is believed to have contained the markets of the day. There are many small rooms behind those arches that now hold more of the broken columns and pediments that are still beautiful works of art. From the hemisphere of Trajan’s forum, a great view of Trajan’s column and the Vittoriano can be seen. 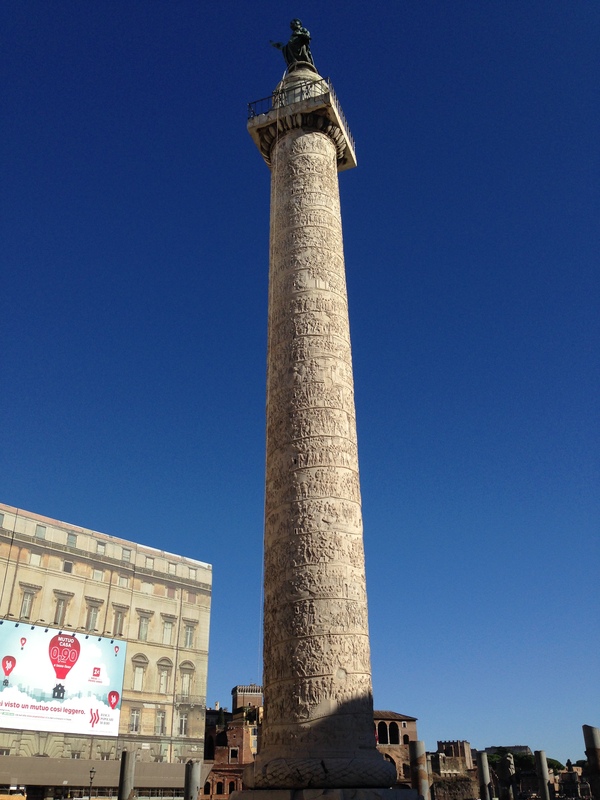 Trajan’s Column is just behind the forum and is one of several columns around the city of Rome. Trajan’s Column honours the Emperor Trajan’s defeat of the Dacians in a war from 101-106 AD, considered the “defining event” of his time in power. The relief carvings that wind up the tower depict the battle and defeat of the Dacians, which brought a “staggering” amount of riches to Rome and paid for the construction of Trajan’s Forum. The bronze statue at the top is none other than Trajan himself. The other landmark that can be seen from the back of Trajan’s Forum, Vittoriano, is huge! Designed by Giuseppe Sacconi, this monument to Victor Emmanuel II was built between 1885 and 1911 to celebrate the first king of a unified Italy. 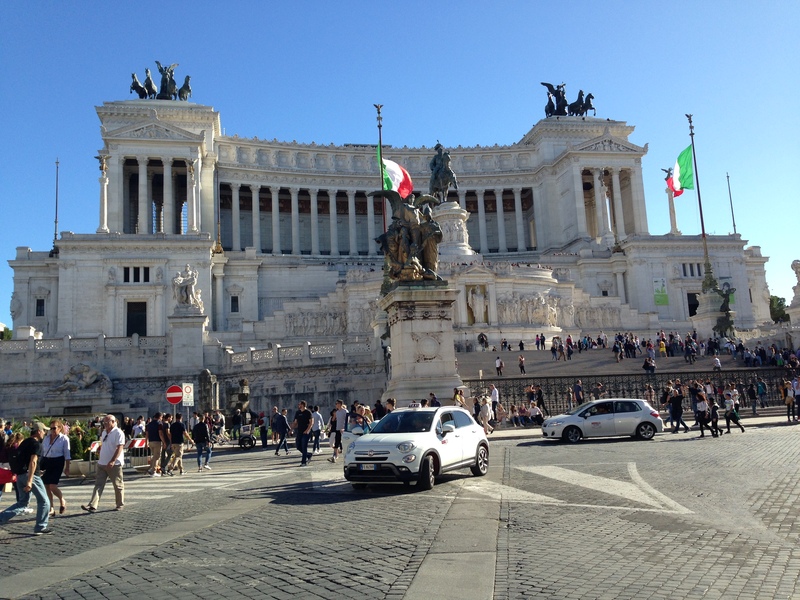 The enormous building houses the Museum of Italian Unification, the Tomb of the Unknown Soldier, and the Shrine of the Flags. The monument is a huge tourist attraction now, but it isn’t without its controversy. A part of the historic Capitoline Hill as well as a medieval neighbourhood were destroyed to build it. Because of the bright white colour in an area of Rome that is not white, it stands out and has earned some nicknames from the people of Rome, who still are not thrilled with its presence, including the wedding cake, the set of false teeth or la dentiera, the typewriter or macchina da scrivere and English soup dessert or la zuppa inglese. Lastly, for today’s post is one of the first smaller bits that we stumbled upon on the tourist map. It’s called “Area Sacra” or Sacred Area. It’s fenced off and it has obviously been excavated out since it sits a bit lower than street level. It’s also surrounded by several busy streets, but is quite interesting. 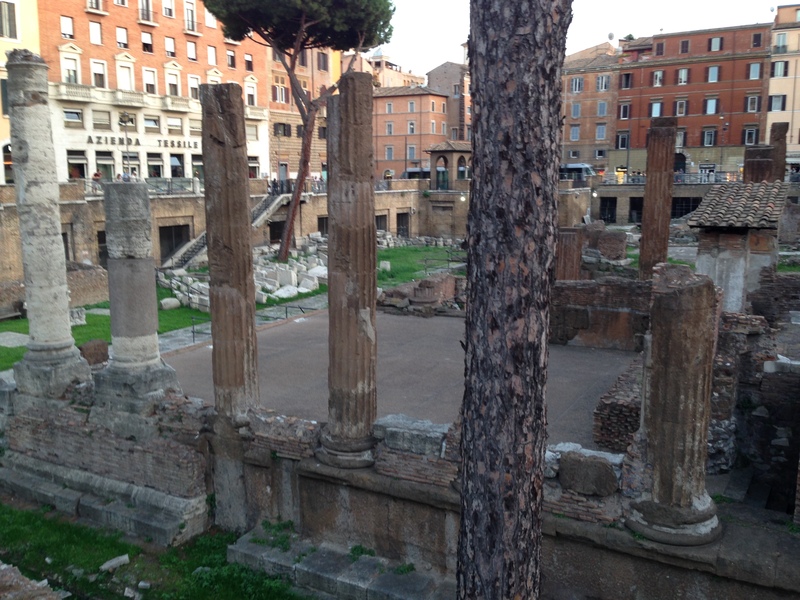 In fact, its full name is Area Sacra Di Largo Argentina. Discovered in 1920, this archeological site contains the remains of temples that date back to the Republic of Rome and was once part of Campus Martius. In fact, this spot also contains the remains of Pompey’s Theatre, so nearby was the “curia” or building where Julius Caesar was killed. Frescos can be seen if you look carefully under some of the more modern constructed roofs there to protect them from the elements and if you stand there long enough, you will see a cat or two in the ruins since the site is a cat sanctuary. I have thoroughly enjoyed your travels, historical background and photos. It has brought back many memories for me, and, yet I continue to learn. Thank you. Thanks so much! I love going back and researching where we’ve traveled. I always learn something more than what is at the site and it’s fun to have it down to go back over. I’m glad you’re enjoying it too! History around ever corner! A perfect vacation! I love the fragment of the griffin. Wonderful pictures, I love them. I love history.It is somehow magical !